In commercial or other professional facilities, a variety of rooms may have to be able to perform for many complex events. First and primary, a presentation area must be a place where you can hear the spoken word without fatigue or stress. Hearing fatigue (a real issue) is when listeners are spending more time trying to hear rather than understanding what was said. In fact, seeing a person talk in one location but their voice sounds are coming from another can contribute to the distraction. Volume is important, but articulation is even more critical when any sound system is in operation. The second function of a meeting space could be visual presentations, but this article will focus on Audio, which is often more important and paramount to the presentation. Proper sound is foundational and is the focus here, but video will be addressed in future writings. How bright is your room? We are talking acoustics here not lighting. When you make a sound in the space does it reverberate or take a second or two to stop? If so, this could be a bright room. The best environment for sound in meetings areas is a dead room. No echoes or reverberation. If you have a dead-room you are in a good starting position. Now all you need is the right sound system with the proper components and you can get the sound you need where you need it. If the room is “highly reverberant” or “bright” you need to overcome that hurdle before you install any sound components. The highest quality sound system can be installed in a highly reverberant field and the reflections and/or echoes can kill the performance of any electronics. If this is a challenge for your facility, start thinking about sound deadening (or absorptive) additions to the space. Soft materials like carpet, drapery, acoustic tile, etc. can greatly improve the sound in a bright room. This issue should be addressed as a priority, especially if your current sound system is not performing to your expectations. Electronics like digital signal processing can help, but they may not be able to overcome the more difficult acoustic hurdles. 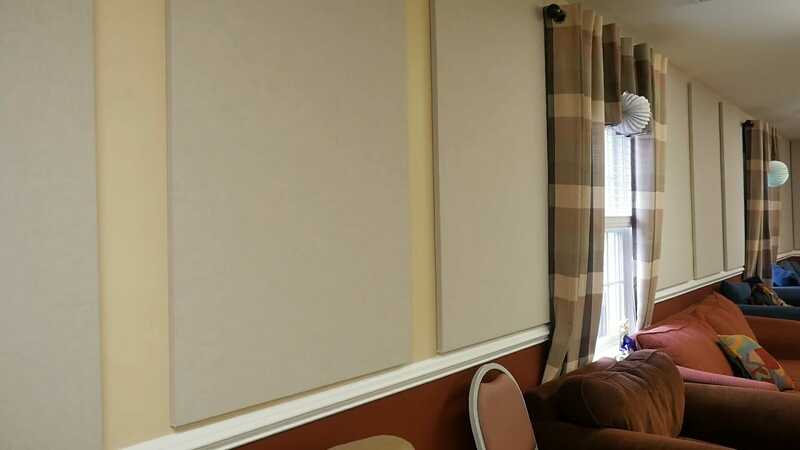 A true sound professional can tell you whether a room needs Acoustical treatment or today’s sound system technology can overcome your issues. Once a sound professional has walked your space, he/she should be able to recognize which course of action is necessary to start with. A combination of room acoustics and sound system components must be balanced in order to best reach your listeners. Take the time to consider both whenever you choose a space for an audience to gather. Sound is more critical than most people imagine and conscious as well as subconscious factors are at play. If you want to reach your audience with the best possible results, the right sound (and video) will be a valuable and irreplaceable tool.